Looking to rebound from Friday’s last-second loss, EMU’s soccer men torched the nets for four goals and their first victory of the season. The Royals scored twice in each half as they rolled over Marymount by a final of 4-1 to split their two matches at the UMW Soccer Classic in Fredericksburg, Va. 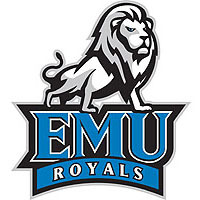 Transfer Juan Luna (Mount Jackson, Va./Stonewall Jackson) scored for the second straight game, as he got Eastern Mennonite rolling with an assist from Joao Downs (Limon, Costa Rica/Colegio de Limon Diurno) in the 28th minute. Just ten minutes later, Jonathan Bush (Pottstown, Pa./Owen J. Roberts) knocked in a header after a corner kick to make it 2-0. Seniors Mark Mast (Harrisonburg, Va./Eastern Mennonite) andAdam Moyer (Harleysville, Va./Christopher Dock) teamed up early in the second to squash the Saints’ hopes. Moyer scored with an assist from Mast in the 53rd minute to make it 3-0. Marymount finally got on the board in the 63rd minute, butMacson McGuigan (Berryville, Va./Clarke County) notched the final goal by sticking in a rebounded shot from Moyer in the 82nd. The Royals had a hefty 14-3 advantage in shots, including 8-1 on goal. Andrew Yoder (Harrisonburg, Va./Eastern Mennonite) and Matthew Overacker (Mount Crawford, Va./Turner Ashby) combined for the win in the net. Now 1-1, EMU prepares for their home opener against Southern Virginia on Wednesday. A free video webcast will be available for the men’s/women’s doubleheader with SVU.